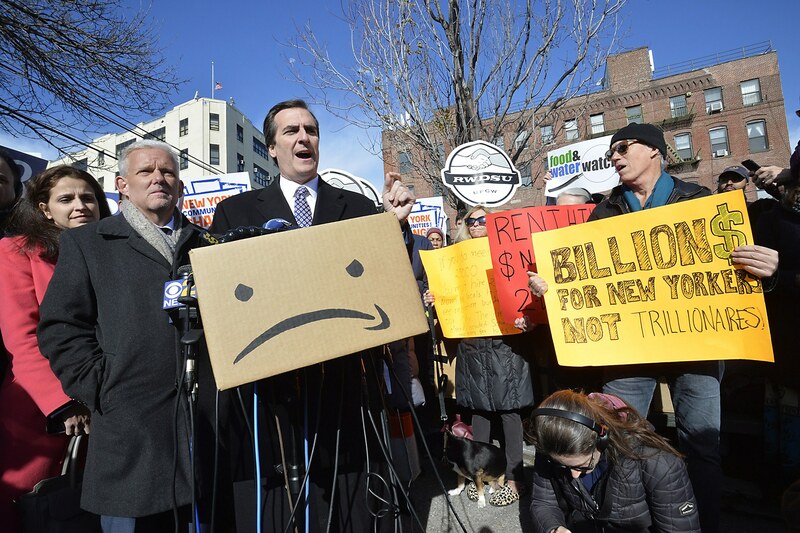 The big picture: Amazon's plan to build regional offices in New York City is not going over too well with residents or the city council. While the HQ2 project is expected to bring in 25,000 jobs and $27.5 billion in taxes over the next 25 years, the initial outlay to the taxpayer will be $3 billion in tax incentives to Amazon. Last month Amazon announced that its "HQ2" project would be bringing offices to New York and Virginia. Initially, the news was welcomed as the deal would bring some 25,000 jobs with it. However, once residents learned that they would be footing the bill to the tune of billions of dollars for one of the wealthiest companies in the US, they weren’t so happy about it. On Wednesday, Amazon representatives attended a New York City Council hearing discussing the project. Concerned citizens and about 150 protesters were also in attendance. As expected one of the biggest concerns was the $3 billion in tax incentives. According to BuzzFeed, even New York City Council Speaker Corey Johnson voiced disapproval of the deal. James Patchett, president of New York City’s Economic Development Corporation and Amazon’s Vice President of Public Policy Brian Huseman, defended the HQ2 project saying that over the next 25 years the company will bring in an estimated $27.5 billion in tax revenue for the city and the state. Despite protests and the city council’s disapproval, there is not likely much that can be done to stop the project. The New York Times notes that the deal was made behind closed doors with New York State and the city’s Economic Development Corporation. So the city council does not have the authority to cancel the plan. Amazon’s PR department has been campaigning for the deal and seems to be making some headway. Although the protesters at the meeting were vocal, a Quinnipiac University poll found that 57 percent of New Yorkers were in favor of the HQ2 project, while only 26 percent expressed disapproval. So cancellation seems unlikely.